I’ve been busy this summer recuperating from my first year of grad school, preparing for my second, and completing an internship in between – but I’ve had much more time to watch television shows and movies I’ve been meaning to see and/or anticipating. 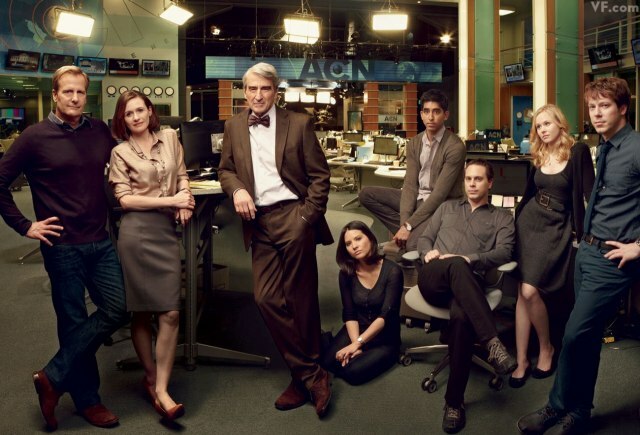 One major new show I’ve been following is HBO’s The Newsroom, which follows the lives of the staff of a major news program and all the drama associated with their work and personal lives. The show is set in the recent past, including actual events that occurred not too long ago, like the BP oil spill, the rise of the Tea Party, the midterm Congress elections, and other events; the show is around January 2011 at the moment. I’ve really enjoyed the show; the characters are each intriguing in their own right, the quick pace of the news world is conveyed, there’s humor and drama and romance, all in that uniquely HBO blend. However, the part that truly intrigues me is that the line between real-life and this fictionalized world seems to be more blurred than in other shows with “realistic” settings. I mean, don’t get me wrong. Maybe there really is a crazy vampire/werewolf/shifter/fairy/witch power struggle occurring in the backwoods of Louisiana (True Blood) or a group of friends who have the most random adventures at the least structured community college in existence (Community) or a lovable Type-A OCD micro-managing woman who really wants to improve America’s parks en route to becoming president (Parks & Recreation) out there. However, until I can quit my PhD and attend a community college that allows week-long paintball battles for free ice cream, I’m going to keep believing these shows are just fiction. However with The Newsroom, that suspension of disbelief is harder to come by, as it’s a blatant commentary of the behavior of the media in our country. Plot points like facts being exposed as having been skewed by politicians to influence ratings; pressure from network owners to lay off on certain stories due to the parties of interest being backers of the network’s company; information being stated as fact without being verified and later having to be retracted – these are all points that we as viewers can agree are bad in the show and feel excited for the characters when they expose these practices and try to behave differently from these norms. The thing though is that these actions happen every day in the real media. I’m not exactly sure what Aaron Sorkin, the show’s creator, intended with his show, but it has some strong political and social commentary and it’s got at least me reflecting on how I feel about the issues brought up in the show and their counterparts in the real world. It would be really great if real news corporations started questioning their own practices as a result of this show, but, as that is probably not going to happen anytime soon, at least it has us viewers rooting for the fictional characters trying to overcome these practices themselves. Check out the show, let me know what you think!